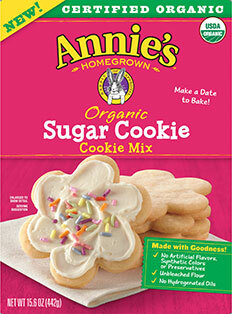 Make a date to bake and decorate with Annie's Organic Sugar Cookie Mix! Made with the goodness of Annie's ingredient promise, this delicious mix makes it easy to bake the homemade treats you love, minus all the bad stuff like GMOs, artificial flavors, synthetic colors, preservative, bleached flour and hydrogenated oils. Just add 1/2 cup of your preferred vegan butter alternative (or, 1/3 cup vegetable oil), egg replacer, and you'll have a pan of around 20 deliciously amazing sugar cookies after baking for just 9-11 minutes! 15.6 oz. (442g) box is $7.49.